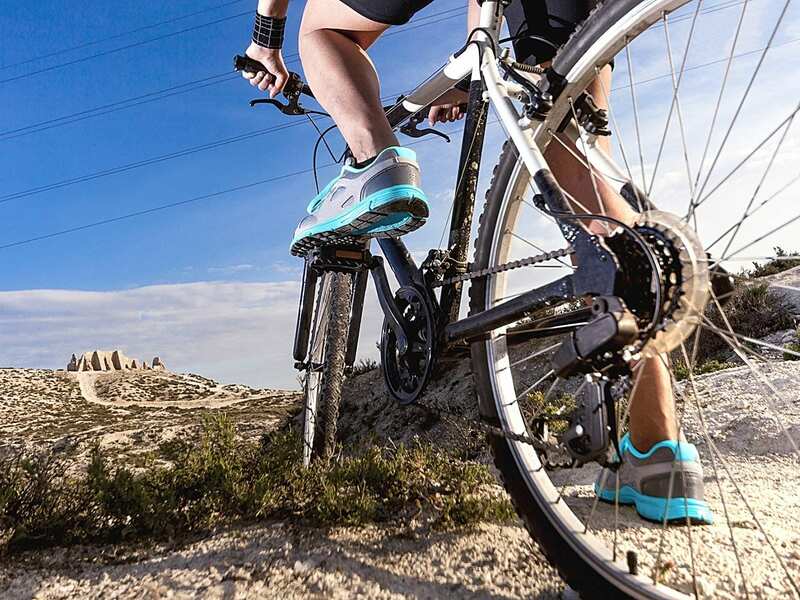 Many people consider cycling to be a health activity, and for the most part it is. It builds up muscle tone, it’s good for the heart and it’s relaxing too. Many people now choose to cycle to work but cycling in towns and cities now presents a new danger. Cyclists are well aware of the dangers of cycling in heavy traffic, and go to great lengths to be seen so they don’t have an accident. Not all dangers can be seen though. Pollution and smog are increasing in our towns and cities all the time, and these now pose a new health hazard to anyone cycling in urban areas. Even cycling through the countryside can pose health risks if you suffer from hay fever or asthma, as you have no shelter from the pollen in the air. 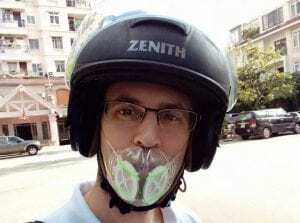 The best way to protect yourself when cycling is to get a cycling pollution mask. This will filter out any harmful chemicals in the air as well as block any particles suspended in the air. A mask may look a little uncomfortable, but if you get one which fits you properly, you will enjoy many healthier cycle rides. As well as fitting the contours of your face so there no gaps for any matter to get through, pollution masks have a filtration system which filters out harmful gases as well as any particles which may be in the air. Cycling gets the heart pumping but it also means you tend to breathe through your mouth. Breathing this way means you take in more air, but taking in larger lungfuls of air may leave you, literally, gasping for breath. In towns and cities, smog and pollution is at an all time high, and it’s getting worse all the time. Exhaust fumes from traffic contains hazardous gases, so cycling through traffic can be more of a nightmare than you think. While there is still uncertainty about how effective pollution masks are, it never hurts to take precautions where your health and well being are concerned. There are some health problems where a mask may be able to help and some which they can help you prevent. There are many different chemicals and gases which make up air pollution and smog, and here are just a few and how they can adversely affect your health. Carbon monoxide: One of the main causes for carbon monoxide in our air is from exhaust fumes. Breathing in too much carbon monoxide can negatively affect the amount of oxygen in the blood. As this oxygen is vital to all the important organs in the body, this can cause coughs, fatigue, confusion and even heart problems. Nitrogen oxides: Nitrogen dioxide is just one of these gases, and it mostly comes from exhaust fumes. Any form of combustion in the air causes nitrogen oxides, and this includes some sectors of industry. Apart from its rather unpleasant smell, it can also cause inflammation of the lining of the lungs, which can result in coughs, bronchitis and asthma. Ground level ozone: When nitrogen oxides react with certain other chemicals, known as Volatile Organic Compounds such as those found in exhaust fumes, it forms ground level ozone. Ozone is known to cause coughs and trigger asthma attacks as it irritates the lining in the nose, lungs and airways. It can also irritate the eyes and nose. Partilculate matter: This covers a multitude of things, and can also include some very harmful substances. Particulate matter refers to all particles suspended in the air. It includes such things as soot from fires, pollen from plants, general dirt and dust and just about anything which can be suspended in the air. Unfortunately thanks to the ever increasing smog, these particles don’t disperse and just stay locked in the air. Needless to say, breathing these is can have a very nasty effect on your health. Lead: This is caused mainly by the combustion of coal, so is more prevalent in manufacturing areas. Lead can cause kidney problems, gastrointestinal problems and even damage to the nervous system. To filter out these chemicals and particles when you breathe, you need a cycling pollution mask. With their help you can cycle wherever you want knowing that you are not breathing in pollution and smog. While research is still being carried out with regard to the effectiveness of pollution masks, there is no doubt that prevention is better than cure. Even if your mask doesn’t filter out all air pollution, it should filter out enough to keep you healthy. Most masks will filter out 95% upwards so they really can help to keep you prevent some unpleasant illnesses. There are many health problems a mask can help you prevent, and here are just a few. Asthma and allergy sufferers are the ones who suffer most when smog and pollution levels are at their highest. Any pollutants in the air, such as exhaust fumes, pollen or smoke, has more of an effect on these sufferers as these pollutants irritate the airways. The particulate matter, especially the very small bits which you can’t see, can often get in to the lungs too, and if you’re breathing through your mouth, this is far more likely to happen. This adds to the inflammation of the airways and an asthma attack is highly likely. Similarly allergy sufferers can have their allergies triggered by the irritants in the air. If you are exposed to air pollution often enough, it could also trigger asthma in those who don’t already have it. A cycling pollution mask can help protect you from asthma attacks caused by exposure to pollution by filtering out harmful chemicals and particles in the air. A mask with a Hepa-filter is designed for allergy sufferers and it will filter out more of the substances which are known to irritate the airways. Pollution can also be the cause of persistent coughs. Directly breathing in particulate matter is cause enough, but when you look more closely at some of the other chemicals in the air, it’s no surprise those exposed to pollution start coughing. Exhaust fumes are a real hazard in towns, particularly as traffic moves slowly so cars create more emissions. The combination of nitrogen oxide and hydrocarbons, the ground level ozone and dust, all combine to make a very unpleasant environment. One study has shown that pollutants in the air can also trigger the nerve endings in the lungs, which in turn triggers a cough. 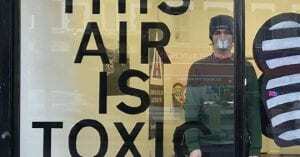 A cycling pollution mask can block these pollutants and stop them from triggering this reaction. If you’re not breathing in clean air, it’s no surprise you could get a headache, and migraine sufferers are particularly vulnerable to high pollution levels. We all know that the body relies on clean air to function property. The impurities in the air, such as ozone, carbon monoxide and particulate matter are known to cause headaches. Over exposure to them can also cause persistent headaches or migraines. A cycling pollution mask can help prevent headaches caused by air pollution as it will help you to breathe in purer, cleaner air. When you exercise you heart rate increases as blood is pumped around your body. Blood vessels deliver oxygen to all parts of your body, so if you are breathing in polluted air, your oxygen intake will be affected. As you are cycling, you are using up more oxygen as well, so you need to breathe in more to replace it. If the air is polluted, this can affect how hard you feel you can exercise. You may feel tired a lot quicker than normal and either have to cut your cycle trip short, or cycle more slowly. If you wear a cycling pollution mask, the air that you breathe in will be a lot cleaner. This means you are less likely to feel so tired so you can cycle for longer or pedal harder. This cleaner air not only means your body is healthier in general, but by being able to exercise harder you are getting far more physical benefit from your cycling. A cycling pollution mask may seem bulky and awkward at first but it’s worth persisting if you want to fully enjoy your cycling. If it is the right size and well fitted you will soon be able to relax while wearing it. For the best results, keep the filters clean and change them as often as you need to. If they get too clogged up, the mask won’t be able to do its job. As you get used to your mask you’ll soon feel the benefit of wearing it. You’ll feel fitter, healthier and more alert, particularly when cycling in high density urban areas. With pollution and smog set to rise in all our major cities, the one thing you won’t need to worry about is cycling on a high pollution day: your mask means you can cycle anytime you want to.